Sacred service is the pathway to joy. 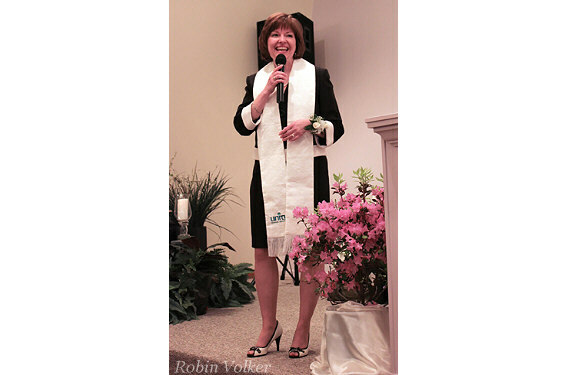 Robin is an ordained Unity minister and New Thought teacher. She delights in teaching spiritual principles and is committed to supporting others in creating healthier, happier and more abundant lives. Guest Speaking – Rev. Robin is available to speak at your church or center for one Sunday or a series of Sundays while the minister receives some much deserved time off. Inquire about availability and series packages. Positive Spirituality Classes – Rev. Robin teaches a positive, progressive class each quarter of the year. These thought-provoking and consciousness building classes are based on authors such as Charles Fillmore, Ernest Holmes, Emmitt Fox, Eric Butterworth, Wayne Dyer, Deepak Chopra, Marianne Williams, and more. Inquire regarding the next class offering. Sign up for Rev. Robin’s Stepping Stones e-letter so you don’t miss out on great classes. Weddings and Renewals – Rev. Robin loves to create customized wedding ceremonies just for you to celebrate your special day of commitment. Whether you desire simple or extravagant ceremony, Robin can help you create a beautiful and fulfilling experience. Contact Robin for more information. Pre and Post Marital Counseling Options – Invest a little time and energy now and reap the rewards for years to come. Email Rev. Robin for details. Memorials and Funerals – Like weddings, memorials are a special time in a family’s life. Memorials deserve care and attention from an attentive and compassionate officiant. Rev. Robin will meet with the family and extract the very best memories to make your loved one’s celebration of life a healing and loving experience. Contact Rev. Robin to inquire about availability. Other Ceremonies – Rev. Robin is available for Christenings, Pet Blessings, and Home or Business Blessings. Contact Robin to create your special ceremony. Not-for-Profit and Church Board Trainings – Skilled in organizational development and leadership, Rev. Robin can lead your group through trainings to establish Values, Vision, Mission, Strategies, and Action Steps. This multi-session training series will bring clarity and intention to the leadership team, engage major players, and spur right action for the overall group, church, or center. Contact Rev. Robin for a proposal of services. Ministry Leadership Training – Is your church or center ready for its next level of growth? Are your lay leaders trained to support this growth? Rev. Robin presents an in-depth, onsite series of trainings that will boast your organizational infrastructure, create congregational buy-in, and produce measureable results. This training is only offered twice yearly. Don’t wait, contact Rev. Robin now to inquire. Create a special day. Learn something new. Contact Rev. Robin to inquire about availability and special classes. “This workshop helped me to identify the actions that limit me and what actions will get me where I want to go." Please email or message me through Facebook to inquire. Thank you. Copyright (c) 2018 Robin Volker. All rights reserved.